Meat Producers And, Ultimately, Consumers Hurt By Drought : The Salt The crops taking the worst hit from the current drought are the ones we feed to animals, like corn. Higher corn prices mean it can cost more to feed pigs and cattle than they will fetch at market, meaning higher meat prices for all. These piglets on the Hardin farm in Danville, Ind., are going to cost more to feed than they will fetch at market. Despite headlines about the crushing drought that's afflicting much of the country's prime agricultural land, the USDA isn't expecting any dramatic increases in the price of food this year or next. But you can see small signs of the drought's effects if you look closely at the agency's latest forecast of food prices, which it released today. Meat prices are expected to go up more than fruits and vegetables, for instance, and that's on top of a hefty increase in meat prices last year. The reason? Most of the crops that we eat aren't really suffering. The vegetables and the fruit generally come from irrigated fields, and there's plenty of wheat for our bread and pasta. The wheat harvest comes early enough that it beat the drought. The crops that are really getting hammered are the ones we feed to animals. Across the western plains, it's the grasslands, where cattle graze. In Illinois or Indiana, it's soybeans and above all, it's America's No. 1 agricultural crop: corn. Here's another important fact when it comes to understanding where the economic impact of this drought will fall. About three-quarters of the farmers who grow corn and soybeans bought government-subsidized crop insurance this year. That will cover most of their losses. In fact, the farmers who picked the right kind of crop insurance will earn more money this year than they would have had there been no drought at all. But there's no such insurance for the farmers who need that corn to feed their animals, such as David Hardin and his father, John, in Danville, Ind. They raise about 11,000 pigs each year. For the first time that David Hardin can remember, their own farm won't grow enough to feed those pigs. "We've started to go out and buy corn on the open market, at the market price," he says. Last week, they paid $8.30 a bushel — twice what corn cost two years ago. When corn is that expensive, Hardin is almost guaranteed to lose money. It costs more to feed the animals than he'll ever get paid for their meat. The same goes for chickens and cattle. If a farm were a factory, you'd just shut it down for a while, and start up again when prices were better. But you can't just flip a switch with animals. When I visited the Hardin farm on Monday, I saw three-week-old piglets, swarming over their mothers. "On Wednesday, we'll be weaning them from their mothers and taking them back to one of our nurseries," Hardin said. 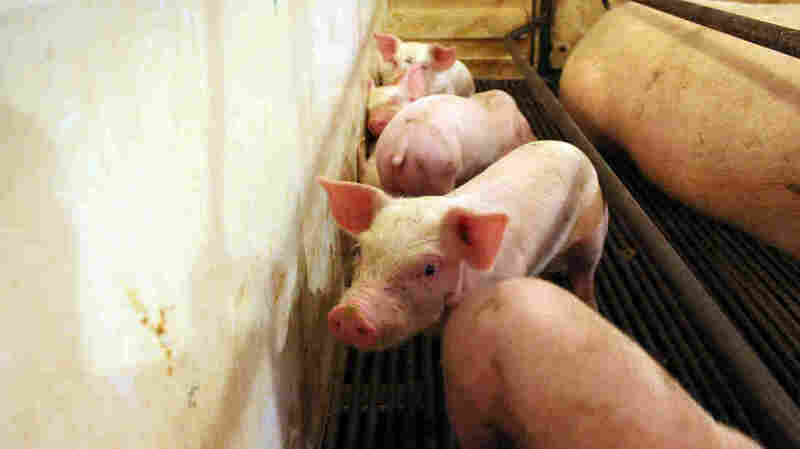 These piglets will be money losers, "but the animals are on the ground, as we say," Hardin told me, and he'll just have to limit those losses by getting them up to market weight as quickly and efficiently as possible. They have to keep the sows, too — at least most of them. If they want to have mother pigs popping out piglets 18 months from now when raising pigs may be profitable again, they have to keep feeding those sows now. John Hardin says the goal is to ride out the storm. "There is no doubt that for the next several months we will be in a position of loss to be managed around," he says. Much of that management involves cutting down the number of animals that farmers have to feed. Hogs, dairy cows, beef cattle and chickens all are getting slaughtered in greater than normal numbers at the moment. Herds are shrinking. Some farmers are getting out of the business entirely. That's actually increasing the amount of meat for sale right now. Down the road, though — certainly by next year — there will be less pork, beef and chicken for sale. That will drive up prices for meat in the supermarket, "so in the end, consumers will pay," says Christopher Hurt, an agricultural economist at Purdue University. "But the problem for the livestock industry is, for the next year, or even year and a half, there can be some very large losses until they can get to better returns that will come in the second half of 2013 or 2014." They'll really be able to cash in if there's normal rain next year and a better corn harvest. Still, that's uncertain. And the uncertainty haunts Mark Legan, a farmer in Coatesville, Ind., with a herd of 3,000 sows to feed. He says that he does expect to ride out the tough times. But he's never seen anything like it since he started farming 22 years ago. "It's really uncharted waters for me," he says quietly, sitting in his truck. "It really starts to play on your mind, too. My wife wants to know what's wrong with me at the end of the day, when I come in." And it's more than just the financial situation, he says. Part of the stress just comes from watching the crops wither in the fields.